A return to the Nintendo Gameboy Advance for Spyro, this version of The Legend of Spyro: A New Beginning is developed by Krome Studios, the same developers as for the main console version. Anyway, welcome to my walkthrough for the Nintendo Gameboy Advance version of Vivendi Games' newest addition to the Spyro the Dragon franchise, The Legend of Spyro: A New Beginning. As you might expect with a walkthrough, I will be 'walking' you through the game from start to finish, of course the guide has the possibility of spoilers so read with care if you mind that sort of thing. Most of the gems you find will come from defeated enemies, but you can also find them inside Gem Clusters dotted around the place, usually you're sure to find at least one down an 'alternate' path. Also, you can earn Blue Gems by completing the mini-games. If you've played previous Spyro games you'll remember that Sparx showed how many hits Spyro could take before he keeled over and died, however, like in Spyro: Shadow Legacy, Sparx no longer has this function and instead Spyro has a health meter. 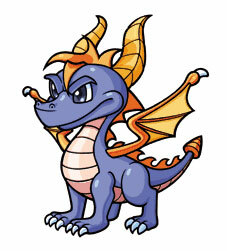 In the top left of the screen you'll see (when in use) a red bar which is depleted whenever Spyro gets hit by an enemy. To fill this back up you'll have to collect Red Gems, which, luckily enough, just happen to fall out of those same enemies that hurt you when you kill them, leaving you no worse off. The Purple Gems that fuel Spyro's Fury attacks drop from enemies that you kill, but unlike Spyro's breath attacks, the Fury attack can only be used once the purple meter in the bottom left of the screen is completely full, you'll see an icon signifying this. Each Fury Attack is powerful enough to kill all enemies on the screen in one go, and once you use it your meter empties completely. As you collect Blue Gems through the game, most obviously by completing set challenges, a blue meter underneath your health will fill up. Once it does so you earn a single experience point that you can put into any one of your current breath types on the Level Up screen of the Pause Menu. Oddly it's not a permanent procedure so you can prioritise your current breath to having full so all you really need for full strength breath is to have two points. You'll see a small flashing icon in the HUD next to the meter if you have an unspent point. Having a higher power move will increase the damage done by the primary and secondary attacks of that breath type but since all Fury attacks are one-hit-kill anyway it has no effect on it. The GBA Version is underrated! I like this version! even though the GBA version is easy, it can be a little hard, and its awesome!!!!!!! I won the GBA version like 23 times. It's SO....................... easy, but it's my opinoin.